In a region ringed by mountains lies Halruaa, a nation of reclusive wizards. This rich realm is famous for its gold mines, its fiery Haerlu wine, and most of all, its magic. Halruaans wizards, like their mighty Netherese ancestors, crave powerful magic and pursue their craft with fanatical devotion, and even Halruaans who do not practice the Art respect its inescapable power and influence. Halruaa is almost completely encircled by the Walls of Halruaa, a series of mountain ranges that form the eastern, northern, and western borders of the country. The coastline of the Great Sea forms its southern boundary. Halruaa stretches approximately 500 miles from east to west, and more than 350 miles from the coast to the northern foothills. The vast majority of the country consists of flat, windswept plains, broken only by broad, sluggish rivers and the occasional unusual feature. For the most part, Halruaa is a warm, humid land, with temperatures ranging from more than 100 degrees in the summer to between 80 and 90 degrees in the winter. The mountains trap the moisture that rolls in off the sea, producing sudden and frequent thunderstorms. The higher foothills and valleys of the Walls of Halruaa are cooler and more comfortable than the lowlands in the middle, and the mountains are even colder, with permanent snowcaps on the highest peaks. Winter often brings snow to the temples on the mountain slopes as well, though never to the inland plains. The winds blowing off the mountains make life inland more bearable, though the weather patterns produced when they meet over Lake Halruaa make the lake a tricky place to sail. 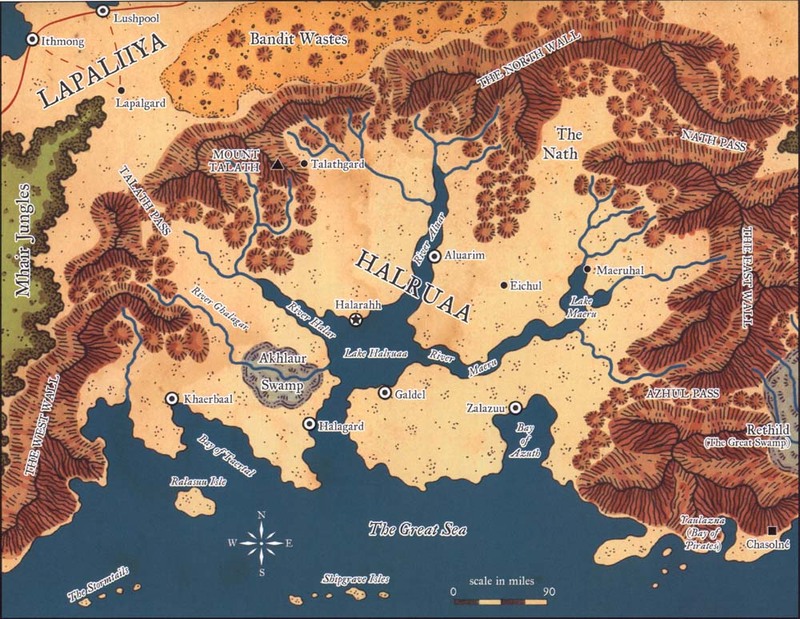 The nation of Halruaa is perhaps the single most isolated country in Faerûn, with the possible exception of some island kingdoms. Great mountains tower over the central plains, their snowcapped peaks tantalizingly out of reach of those who live in this hot, windswept land. High, narrow passes through these severe mountains provide some measure of contact with the rest of the world, as does shipping from the Great Sea to the south. For the most part, however, the wizards of Halruaa live in comfortable dissociation from those around them. This 4,000-square-mile swamp to the west of Lake Halruaa is a warren of dangerous creatures and long-forgotten magic. Named after an ambitious necromancer who set up his hidden and magically defended fortress-home at its center, the Akhlaur wasn't always the size it is today. When the necromancer first went into seclusion, the swamp that flanked the River Ghalagar covered only half the territory it does now. Until recently, the lowlands around the swamp continued to flood at a slow but steady pace, expanding the swamp's boundaries by perhaps 100 feet a year, though the river drained off more than enough water to maintain equilibrium. Most Halruaans knew that the swamp was flooding because of a portal to the Elemental Plane of Water, but few know the whole truth. Akhlaur was an ambitious wizard who focused his attention on researching interplanar connections. When one of his experiments with a connection to the Elemental Plane of Water went awry, the magic he had set in motion went out of control. Magically charged water began to pour through a never-closed portal from that plane, flooding Akhlaur's laboratories and overflowing into the swamp. The portal pumped more water into the swamp than the river could drain effectively. Had it kept expanding, Akhlaur Swamp would eventually have reached the coast, swallowing Halagard in the process. Recently, however, a wild elf magehound named Kiva moved the portal to the Nath by means of a magic device similar to a portable hole, stopping the expansion of the swamp. Later, a sorceress named Tzigone closed it during a battle between the Halruaan wizards and some Mulhorandi invaders. Just before it sealed, Kiva managed to bring Akhlaur back through from the other side. Today, the swamp remains at the size it was when the portal was moved, but many concerns remain - the most important of which, at least to those who know the swamp well, is the presence of the larakens. These bizarre creatures from a distant plane began to appear at about the same time that the flooding began. Few know for sure whether they originated from the Elemental Plane of Water or were simply pulled through from another plane at about the time the portal was opened. Whatever their origin, the larakens present a deadly danger to wizards everywhere because of their magic-draining abilities. The larakens are not the only dangerous creatures dwelling in Akhlaur Swamp. Snakes, crocodiles, and schools of piranhas hide in the shallow areas, and numerous undead - some the results of Akhlaur's strange experiments and others spawned from doomed expeditions - lurk everywhere in the interior of the swamp. Despite these threats, wizards and adventurers often enter the swamp in search of Akhlaur's fabled magic treasures. In the shadow of Halruaa's North Wall lie the desolate barrens known as the Bandit Wastes. The rough, rocky terrain of this region consists of jagged hills and dusty plains, punctuated by draws, ravines, and dry streambeds. This hot and desolate place boasts very little vegetation, water, or shade. Few stay in the region for long unless they must, and those who do stay rarely survive long. In addition to a wide variety of monsters, this region has traditionally served as home to outlaws fleeing the reach of Halruaan, Lapaliiyan, or Shaaryan justice. At present, the worst such group is the Blood Screamers, a band of savage gnome dire weremoles led by a gnome vampire called the Blood-Curdling Scream (CE male rock gnome vampire illusionist 9). This group reportedly lairs in a warren of tunnels dug by giant ants in the barrens east of Lapalgard, and its members raid as far afield as the Rathgaunt Hills and the Nath. This central body of brackish water connects the land's river ports to the sea. Though strong and unpredictable winds blowing in off the mountains make sailing and fishing in the lake tricky - and flying over it in a skyship even trickier - Lake Halruaa is the central hub for the majority of trade and travel passing through the country. Each of Halruaa's major rivers ultimately feeds into Lake Halruaa, and every ship that moves along one of these waterways skirts the lake, hugging the shoreline to avoid the worst of the choppy water and capricious winds before moving into a new channel and completing its route. Because of this heavy shipping traffic, most of the nation's population is concentrated in communities on or near the shores of the lake, including the capital city of Halarahh. Though few Halruaans care to venture out into the wild, hazardous central portion of the lake, more than a few unusual beasts call these waters home. Some of these creatures are likely native to Lake Halruaa, while others migrated up the wide channel connecting it with the Great Sea to the south. Whatever the case, sightings of such creatures are common enough that they cause little stir among the populace. Once in a while, however, an aquatic beast ventures close enough to shore to stir up some excitement. When a real threat is discerned, the local wizards waste little time chasing the interlopers back to the lake's central depths. In the past year, a few unusually large sharks, octopi, and dragon turtles have been spotted, and quite a few folk have reported a winged beast - possibly a dragon - diving into or soaring out of the midst of the lake, usually at night. The Nath, an upland basin of gentle hills in the northeast corner of Halruaa, is known for its herds of wild rothé and auroch, both of which are raised for food. Considerably higher in altitude than most of the rest of the country, this area boasts a slightly more temperate climate. Temperatures in the Nath rarely reach 100 degrees, and the rains, though more frequent, are much gentler, nurturing the meadow grasses upon which the herds graze. Perhaps the most significant features of the Nath Valley are the temples situated on the lower slopes of the mountains that surround the valley. Each of these temples focuses on one school of arcane wizardry above the others. The sects are small because while most in Halruaa profess at least a passing devotion to Mystra or Azuth, few feel the need to cement their connections to the divine through ceremony. The clerics and wizards who tend the temples are the few who have been called to serve the deities of magic in a more formal way. Other than the temples, the valley holds little of significance. The Nath is a rugged, wild country compared to the rest of Halruaa, and those who live here must be prepared for threats from many directions, though by far the greatest threat comes from the east. Crinti riders occasionally sneak through the Nath Pass to harass the herders or raid the temples in the hills. Sizable Crinti forces have invaded this area on more than one occasion, but the powerful magic of the Halruaan aristocracy has always forced them back before they could get much beyond the mouth of the valley. Even so, the folk who by proximity serve as a first line of defense remain ever-watchful for the gray-skinned riders. The major rivers of Halruaa spring from the mountains of the Walls and empty into Lake Halruaa. Most of them widen considerably in the flat plains, often spreading several miles across as they meet the broad lake: At such points, the rivers flow calmly and shallowly, appearing more like channels or inlets of the lake than rivers in the strictest sense. River Ghalagar, on the west side of the lake, is the only runoff from the West Wall that runs through the Akhlaur Swamp. Because of the extraplanar water source that has until recently fueled the Akhlaur's bizarre expansion, the lower Ghalagar is rather swift. The Rivers Halar and Aluer, both of which drain the North Wall, are the widest, most trafficked waterways in Halruaa. Countless villages and towns line the banks of these two rivers, receiving their goods from the merchant ships and barges that pass back and forth along their courses. To the east, connecting Lake Halruaa to Lake Maeru, the River Maeru flows down out of the East Wall. This waterway serves as the main shipping avenue for the vast quantities of gold mined from those mountains, and it too is lined with communities at regular intervals. Like the lake they feed, these watercourses occasionally sport an unusual creature or two. For the most part, however, they host nothing more dangerous than large schools of fish. Three mighty mountain ranges known as The Walls bound Halruaa on the west, north, and east, creating an isolated nation that is most easily reached by sea. The Walls are breathtakingly high, and each range boasts several peaks towering 20,000 feet or more above sea level. Only five major passes though these-mountains connect Halruaa to the often hostile kingdoms beyond. The mountains on the west side of the country are known as Lhairghal, or the West Wall. This range spans more than 350 miles from its southern end, which borders the Great Sea, northward to Talath Pass. The West Wall is split in two by the Mhair Pass, which links Halruaa with the Mhair Jungles on the other side. Where the West Wall meets the North Wall, in the northwest corner of the nation, Talath Pass connects Halruaa with Lapaliiya. The northern range, including the mountains surrounding the Nath, is called the North Wall, or Nathaghal. This stretch of mountains and steep hills runs from Talath Pass on the west to the Nath Pass on the east, spanning a distance of more than 600 miles. The North Wall is divided by the Bandit Pass, which connects Halruaa with the Bandit Wastes to the north. The Nath Pass in the northeastern section of the country provides a corridor between Halruaa and Dambrath. The East Wall is known as the Muaraghal. Like the West Wgll, it stretches more than 310 miles and, like both of the other mountain ranges bordering Halruaa, it is split by a pass. The Azhal Pass lies just south of the river Maeru and connects Halruaa with the Great Swamp, Rethild. The Muaraghal is richly veined with some of the purest gold deposits in Faerûn. Mining in the hills and mountains of the East Wall is perhaps the second most valuable industry in Halruaa, next to magic. The mountains surrounding Halruaa - particularly those that cradle the Nath Valley - are home to the country's various temples of magic. Mount Talath, in the western half of the North Wall, houses the high temple to the deity Mystra and contains one of the largest libraries and storehouses of magic in Faerûn (see Mount Talath, below). All told, the mountains are uncommonly threat-free, at least on the Halruaan side, where long years of careful defense have largely tamed them. The opposite slopes, however, are much wilder, and more dangerous. On the west side lurk nagas, yuan-ti, and other threats from the Mhair Jungles, while a variety of monsters - including bestial gnomes and bandits - roam the north side. On the eastern side, Crinti raiders from the plains of Dambrath and creatures from the Great Swamp, including lizardfolk and mysterious serpent beings, plague the lower slopes. Furthermore, ogres, tall mouthers, giants, perytons, and stray outsiders all call the entire set of mountain ranges home. Most of these creatures, however, know better than to tempt the wrath of the Halruaan wizards, so they rarely brave the high and forbidding peaks to reach the other side of the mountains.